Photos: Nigerian soldier pulls a Hilux van, bag of rice using his teeth. 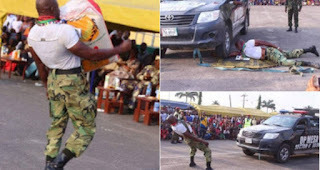 HomeNaija NewsPhotos: Nigerian soldier pulls a Hilux van, bag of rice using his teeth. A Nigerian soldier has been called the strongest after photos of him using his teeth to carry a bag of rice and drag a Hilux van went viral. In another photo, a Hilux van is seen rolling over his right hand supposedly without hurting him. What do we call him? Superman?